1 lb. 5 oz. (600 g). FREE Shipping in USA, $8/bottle internationally. Vitamin, mineral, and amino acid powder to create very low phosphorus homemade dog food. Just mix with fresh foods you like to feed and your dog enjoys. It has extra vitamins present to allow for one time heating to a food safe temperature of 165 degrees F or 74 degrees C.
The dose of supplement is based on what is fed not solely body weight. Please use the FREE Autobalancer EZ tools under the Homemade Food tab to create custom recipes instantly. 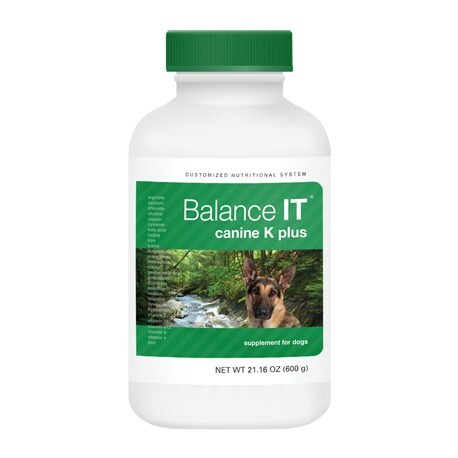 Balance IT® Canine K Plus is measured in 5 cc green scoops and 0.5 cc white scoops. INGREDIENTS: Calcium Carbonate, L-Lysine Acetate, Potassium Citrate, Choline Bitartrate, Sodium Bicarbonate, L-Threonine, Magnesium Sulfate, Potassium Chloride, L-Arginine, Powdered Cellulose, L-Tryptophan, Vitamin E Supplement, L-Cysteine Hydrochloride, L-Methionine, Zinc Sulfate, Ferrous Sulfate, Niacin Supplement, Calcium Pantothenate, Vitamin A Supplement, Thiamine Hydrochloride, Riboflavin Supplement, Potassium Iodide, Vitamin B12 Supplement, Copper Sulfate, Vitamin D2 Supplement, Manganese Sulfate, Pyridoxine Hydrochloride (Source of Vitamin B6), Sodium Selenite, Folic Acid. 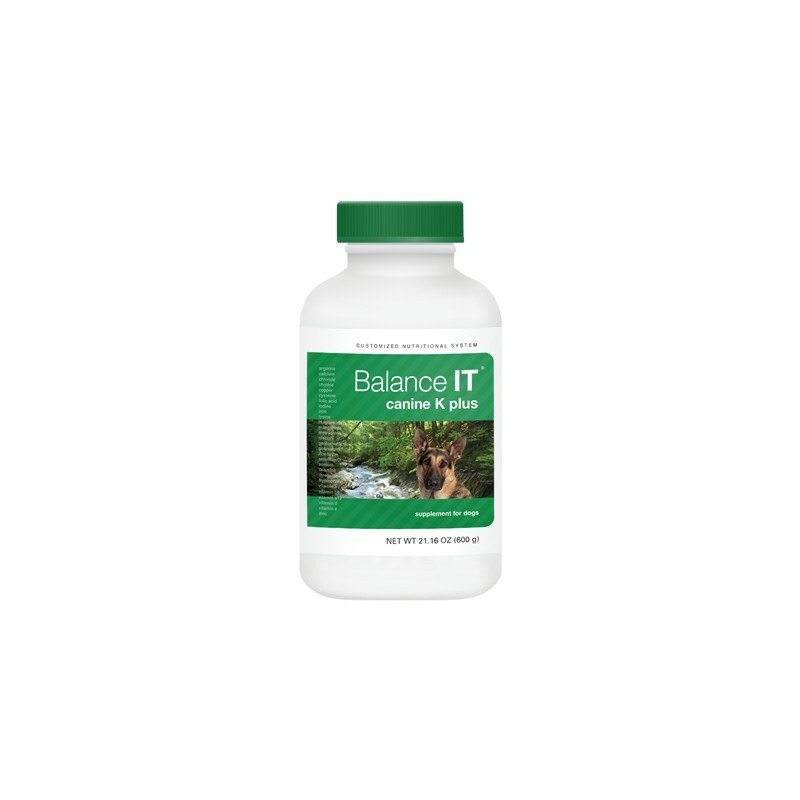 Balance IT® Canine K Plus comes with a 5 cc green scoop and a 0.5 cc white scoop and has a net weight of 21.16 ounces (600 grams).